Russia had a rough time in 2014. Crashing oil prices and sanctions from the West caused the ruble to fall 46% to an all-time low of 80 rubles to 1 U.S. dollar. Inflation climbed all the way to 11.4%. 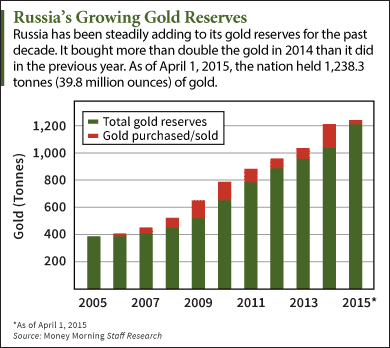 While its economy suffered, Russia continued aggressively adding to its gold reserves. It's estimated Russia bought more than double the gold in 2014 than it did the previous year: 156 tonnes versus 77 tonnes. What's behind Russia's insatiable thirst for the yellow metal? And what does it mean for the rest of us? For the past decade, Russia has been steadily increasing its official gold reserves. It has more than tripled its gold hoard since 2005 and holds the most since at least 1993, according to International Monetary Fund data. Some of Russia's gold comes from domestic production. Sanctions prevent exports, so the government picks up the slack. And with gold prices near multi-year lows, it's likely to turn out to be an incredibly profitable move. During the recent ruble crisis, cynics assumed Russia had to be selling gold to support the ruble. I disagreed. I figured they'd choose to hold onto their stash and spend down fiat dollars instead. So far, it appears I was right. In November 2014, the nation's stockpile grew from 37.6 to 38.2 million ounces. In April, reserves climbed to 39.8 million ounces. So recent reports that Russia intends to build up its foreign reserves and gold stock to a value of $500 billion from its current level near $357 billion are particularly intriguing. To minimize possible market impacts, Elvira Nabiullina, head of the Russian central bank, will ensure gold will be bought in carefully measured increments, Bloomberg reports. Russia's economy is expected to contract this year, and oil prices may not recover to previous highs for some time yet. Russian President Vladimir Putin downplays the weakness, saying he believes his country will see economic growth within two years. Jim Rickards, author of The Death of Money: The Coming Collapse of the International Monetary System, recently told CNBC he expects Russia will eventually back its currency with gold, but that day is likely far in the future. I agree with him. 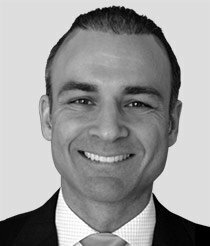 But rather than go it alone, I think Russia will act in concert with several of its neighbors and allies to undermine the U.S. dollar's hegemony. Just look at China. Its gold reserves are among the biggest in the world – but the country has been secretive about how much gold it actually has. China hasn't reported its official gold holdings for six years. It last reported it had 1,054 tonnes in April 2009. With enough of the yellow metal, China gold reserves could actually harm the U.S. dollar. In fact, according to Rickards, if the amount of bullion China owns were suddenly revealed, that unveiling in itself could collapse the U.S. dollar. Russia once had the world's largest gold hoard when it was ruled by the Tsars and before the Communist (October) revolution in 1913. The communists looted it once they took power. They took the gold and sent much of it abroad. This is history. So, Russia can never buy enough gold to replicate the glory of their once prowd empire. Russia is only a washed-out approximation of the wealth the Russian People once owned. It will never happen again. China will own the gold and control the global economy in not so many more years. It won't be the U.S. anymore, and certainly not Russia under any circumstances. There is nothing about the Gold Reserves of US, UK, France and Germany. This is not a serious article. "There is nothing about the Gold Reserves of US, UK, France and Germany. This is not a serious article." ………….USA after second world war took away German Gold and probably spent already. So Germany have no Gold to use for their benefit.